Dave Collins is the founder of Melbourne-based business video production company ANGRYchair. Having worked in television for five years, he gets a lot of inspiration from films and TV shows, and likes to use similar production concepts in his current work. He loves having such a varied job and filming something different every day. How did you get into video and start ANGRYchair? I’ve always been fascinated by video and by the idea of entertaining with the moving image, and telling good stories that move people, influence them and change perceptions. I studied at university and did an internship which led to my first job. I worked in television for five years, starting out in pretty junior positions where I was camera assisting and swinging a fluffy mic, and working through to producer roles. My last job was as a series producer for a TV show on one of the main TV networks here (in Australia). I left that world to start ANGRYchair. Tell us about a typical day at ANGRYchair? A typical day is almost non-existent. One day I might be donning scrubs and going to shoot some surgery, or I could be going to the location of a reality show and shooting behind the scenes, or going to a school to shoot with students and teachers. There’s nothing really typical about our days; the only consistent thing is that you’ll always be doing something different and fun – that’s one of the things I love most about this job. What sort of videos are you making? We strive to make business videos as interesting as possible. There’s a pretty strong perception that any kind of content about a business is boring, and so we strive to tell good stories, compelling stories about people, whatever they do, and really make them entertaining. A lot of it is content marketing, people delivering useful, helpful information to their customer base. People often want a video on their website about themselves, that explains them and builds trust in their audiences. And the next logical step – which there’s a big trend towards – is to create video to convey high-value content to the audience. Whether that’s tips and tricks or sharable content that people would find useful and helpful. It really varies for different industries and what they want. I think one of the biggest challenges is probably good post-production workflow, as everything keeps changing so quickly. Because we’re not shooting on tapes anymore, we have to make sure footage is properly brought in and safely stored in a number of spots so that if anything happens to any of those different places, we can keep working. Then it’s making sure we get the approval process right – that’s pretty much a problem solved with Wipster – and finally delivering it in ways so that people can use it properly and it can be accessible across different devices. How were you collaborating on video before Wipster? It was a bit of a mess actually. We’d use a combination of Vimeo and Dropbox and upload drafts for people to comment on. The biggest problem is that most clients don’t know how to explain exactly what they want changed. With Wipster they can point to it – it’s like they’re standing there in the edit suite, like you’ve got the client’s finger pointing to what they want done. You can work through it really succinctly. Having gone to this workflow, there’s much less second and third drafting. It’s a much cleaner and more efficient process. We create a draft which is exported to the Wipster presets that we use, then send them off to the client to have a look at. Because of how intuitive it is, the clients will know to click and make notes where they need to. Then we print out the list of notes and timecodes, open up our timelines and go through and make changes. More often than not we find inspiration through what we’re watching and engaging with, either online or in TV and film. 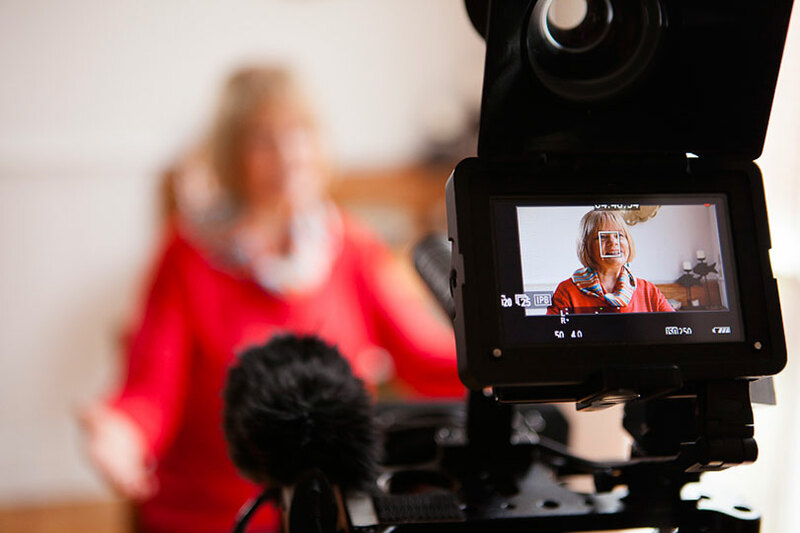 I’ve got this philosophy that business videos should be as compelling as television and film. So we often get storytelling techniques and ideas, even shooting and editing ideas from those media. We try to look at what the big guys are doing with million-dollar marketing budgets – what they are doing that’s fun and cool and fresh. We don’t copy it, but we use that kind of thing to inspire us. And there’s such a wealth of really good stuff online. What separates a good video producer from a great one? I think probably the main thing is their ability to tell a strong story. Whether that’s visually or with words and through an interview. The other thing that’s really crucial is to be able to create a compelling story that people believe. There are a lot of people who deliver stuff that’s less than believable. The other thing that’s central is the freedom to create whatever you like, as long as you’re pleasing the clients. To be properly creative you need to be free. In previous roles I’d be given a brief and go away to be creative with it and I’d come back and the senior creatives would say “no, no, no, we need to do it like this, the same way we’ve always done it”. That crushed me immensely. Both. You want to have lots of good stuff. It’s better to have lots of good stuff than lots of bad stuff, or one bit of good stuff. If you can have lots of good stuff then you can really be conveying a high-quality message to your audience in terms of business clients. You can be delivering this beautiful, compelling, useful content and lots of it. Fans, clients and customers who engage with it can take a lot away from it. Video more than any other medium helps you build trust. I think it’s the best of all the communication channels. You still get to use words, you still get to use images, but you also get to put them all together, and then add music. And more than anything else you can drive emotion. And if you drive the emotion of the viewer, then you can really shift their perception of whatever it is you’re talking about. Do you follow any blogs or online tutorials about video production? I follow Philip Bloom, who is great, and I’m interested in guys like Vincent Laforet and Alex Buono - he’s the DOP of the Saturday Night Live film unit. They talk about technology and stuff, what they’re using and how they’re using it. There are also more and more of the big guys doing big speaking tours through the US. Alex Buono did it last summer, and that was very useful. Vincent Laforet’s just done one, and Adam Epstein, an editor from SNL, is doing one this year. I can’t get to the US so I watch the content online – that’s really helpful, being able to see what guys with huge budgets are doing that’s cool, then work out how you can apply it to clients. What's in store for the future of video? The platform that I’m surprised hasn’t taken off is clickable video. The idea that you should be able to watch a grand slam and click on Rafael Nadal’s shorts or shoes, and the window comes up that says “what size are you”, and then you pay with your credit card. The technology exists, it’s still really expensive to implement, but for true conversion and that real impulse buy, I think there’s huge potential for that. That’s a real way that as advertising spend drops in broadcast, people will be able to monetise video content. Some of the big brands have already picked it up and are doing online catalogues that look like music videos and you can click on the different items of clothing. I think it won’t be too long until we have clickable TV shows. The cool thing about entertainment and media is, as it moves forward, it becomes more and more applicable to an individual. I think the answer is you need to love it and if you don’t love it then find something else. You need to basically work very hard. Especially if you’re working in one of the big creative industries like film or TV, you’ve really got to work very, very hard to get to the point where you can be creative. If you can find a niche or a group of people who are doing the stuff you want to be doing, just get in there, work for free maybe, and really impress them. When I was about 14 I went to an event with Australian film director Phillip Noyce, and he told me to get a camera and start shooting stuff. There’s some real value in that, you can get a lot of experience without having someone telling you how to do it. You can really learn from your own kind of experiences.